providing shade for the people along the main street. 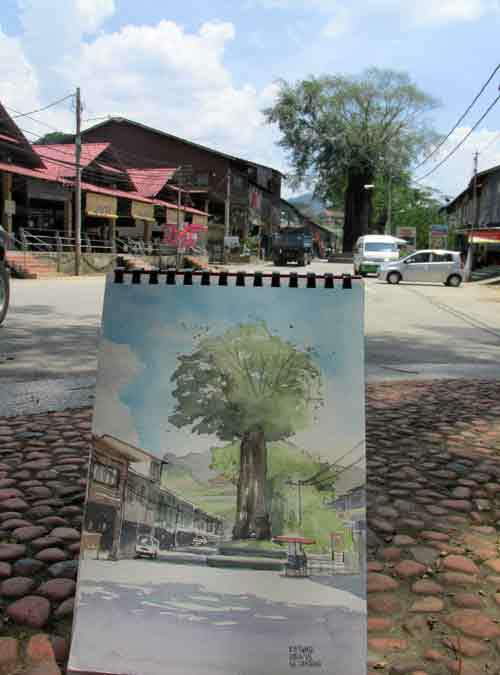 LIKE SENTINELS of time, a row of old trees stand watch over the quaint town of Sungai Lembing from the road island in the middle the main street. According to a friend, the trees were planted by the early settlers in the town which once had the longest pit tin mine in the world. This tree is just a stone’s throw away from the Sungai Lembing food court. A local who watched as I painted this tree explained that the present tree was in fact a Strangler Fig, a type of parasitic tree, which took over its host after having “strangled” it. Only a few of the original giant trees remain. They are believed to have been planted in the early 1800s. The museum is located at the hill top at the far end of this padang. At the far end of the town of Sungai Lembing, where the last of the giant trees provide a shady respite for townsfolk, lies the town’s padang. It is here that the schools nearby and townsfolk hold their activities. 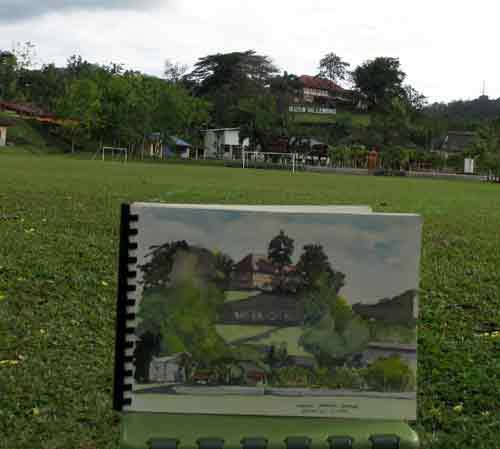 From here, one can see the Sungai Lembing’s main tourist attraction, the Sungai Lembing Museum, perched on the hilltop. I painted this custodian of Sungai Lembing’s rich past in in the evening, just after the rain, using line and wash technique from the northern side of the padang. I am a journalist, having worked with the New Straits Times for over 22 years in various capacities on the editorial team. I took early retirement from regular work to pursue my passion in art at the end of 2014. I founded the KL Sketchers group, the first Urban Sketching group to hold a public exhibition in University Malaya in 2013. I am also founder of several other art groups, including Malaysian Watercolours, Malaysian Plein Aire Artists, and the Asian Watercolours on Facebook. These days I still write but sketch and paint outdoors mostly, looking at life from an artist's point of view. I have been asked by some readers who want to take up watercolour if I conduct classes. I do, occasionally, but not often. If you want to learn watercolour from the basics, write to me. Width redesigned by estung. Simple theme. Powered by Blogger.